A tramway to the 11,245 foot summit was seriously pursued, got government approval, but was finally dropped about 1930. 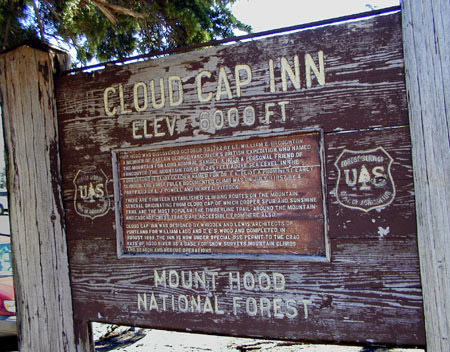 Discussion abounds about whether the log and stone structure of Cloud Cap Inn represents a truly American type of mountain architecture, versus whether its styling is more European-derived, eg. from sources like the Mountain Huts of Austria or Swiss alpine chalets. 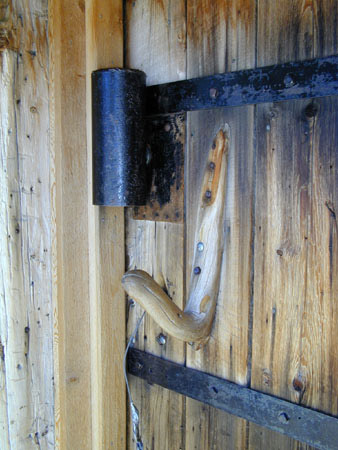 Below is one of the beautiful mountain-weathering details that abound on the exterior of this National Historic mountain Inn. Please click the doorhandle picture, or the link below, to sample a QuickTime movie of 16 further images of historic Cloud Cap Inn and it's mountainous setting high on the NE shoulder of Oregon's Mt. Hood. * including one of my favorite Western artists, Albert Bierstadt (1830-1902).